Based in Perry, Ohio, Marissa Baranauskas is a Division I and cross-country athlete specializing in articles covering distance running and general fitness. Baranauskas is a certified personal trainer and is pursuing her bachelor's degree in exercise physiology at the University of Akron. The hamstrings are an important muscle in running, acting as both a hip extensor and knee flexor, but they tend to be neglected by runners in terms of strengthening and stretching. They are most injury prone when subjected to sudden increases in speed work or workload. A tight hamstring is often the result of not stretching before running and could be indicative of a strain. Hamstring tightness can easily be prevented by incorporating a daily stretching routine in your workouts in the future. Hamstring problems are common among distance runners who have significantly increased their workload or prematurely introduced speed work. The most common cause of tightness after running is a hamstring strain. In a strain, the muscle tends to be tight and painful when stretched. The pain and tightness will generally ease off during running but return again afterward. Muscle strains are most likely caused by not properly stretching before running or a muscle imbalance in which the quadriceps are stronger -- or gluteals weaker -- than the hamstrings. As long as you feel no discomfort, it is OK to continue running with a tight hamstring. Eliminate speed work completely and decrease your weekly mileage until tightness after activity subsides. 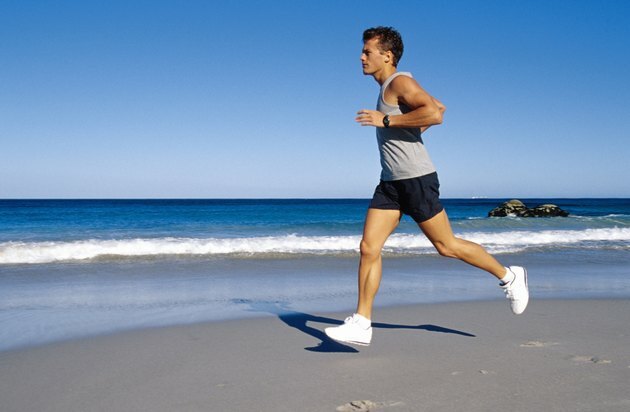 If running is painful, it is advisable to take several days off completely. Ice your hamstring for 10 minutes at least twice a day and take anti-inflammatory medication regularly. Massage the area to relieve tightness and improve blood flow to the injury. Avoid over-stretching the hamstring to prevent further tears. Hamstring tightness can be prevented by incorporating a daily stretching routine into your workout. Walk around for five to seven minutes to properly warm up your muscles before stretching. Hamstring stretches are most effective when performed sitting or lying down. Stretching the hamstrings while standing does not allow the muscles to completely relax. Strengthening the hamstrings by using a leg-curl machine may also prevent hamstring injuries in the future. The modified hurdler stretch is effective in stretching the hamstrings. Begin in a seated position with your right leg extended and your left leg bent with the foot pressed against your right thigh. Your legs should resemble the number four. Slowly lean forward, keeping a flat back, and reach your arms toward your extended right foot until you reach a point of tension in the stretch. Back off the stretch if you feel any pain or discomfort. Hold for 15 to 30 seconds and repeat on the opposite leg.